Physicists in Finland have experimentally created quantum structures that some cosmologists believe were formed seconds after the Big Bang, and may have given birth to dark matter. As detailed in paper recently published in Nature Communications, the researchers at the Low Temperature Laboratory at Aalto University were able to create quantum objects known as half-quantum vortices and walls bounded by strings in superfluid helium. A superfluid is a liquid that has no viscosity and is thus able to flow without losing its energy. Although half-quantum vortices were created in superfluid helium for the first time a few years ago, this is the first time that researchers have demonstrated they are able to survive phase transitions into different types of superfluidity. 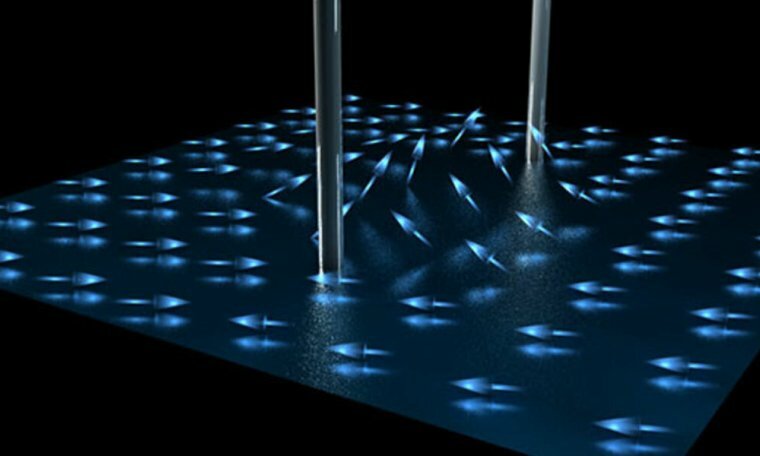 The physicists also demonstrated that after a certain superfluid phase transition these half-quantum vortices form a new quantum object known as walls bounded by strings, which were first predicted by cosmologists decades ago, but never realized in a lab until now. The breakthrough may have applications for testing theories about the early universe, especially certain theories about the origin of dark matter. But before we dive into the significance of the research it will help to have a little background. Breaking symmetry during phase transitions can produce topological defects, artefacts from the original ground state that remain after the system has undergone a phase transition. Consider again the case of liquid water turning into ice. As the temperature drops, the water begins to turn into ice crystals at many different locations, and those crystals grow until they begin to intersect with the other ice crystals. Each of those ice crystals independently have an ordered crystalline structure, but this pattern is broken at the boundaries where they intersect with other ice crystals. The jagged boundaries of the ice crystals are an example of topological defects. At extremely low temperatures, topological defects can take the form of quantum objects such as half-quantum vortices and domain walls. To see if these quantum objects can survive helium’s phase transition between different types of superfluids, the researchers cooled helium-3 down to less than half a millikelvin above absolute zero (theoretically the lowest possible temperature). Depending on the ambient pressure, helium-3 transitions into a superfluid at temperatures between one and three millikelvin. Half-quantum vortices can be thought of as a perpetual whirlpool of helium. According to Jere Mäkinen, a doctoral student and the lead author of the new research, these half-quantum vortices can only be created during helium’s transition into a superfluid in the polar phase. “Polar” here means that the pairs of tightly-bonded helium-3 atoms that are formed during the phase change have an angular momentum, or rotation, that is aligned either “up” or “down.” By orienting itself one way instead of the other during a phase transition, the superfluid helium-3 breaks a fundamental symmetry, which results in the formation of the vortices. While the formation of half-quantum vortices in helium-3 had been demonstrated in previous experiments, what Mäkinen and his colleagues wanted to know was whether the vortices would survive a phase transition into two “deeper” phases of superfluidity that are characterized by polar distortion, known as polar distortion-A (pdA) and polar distortion-B (pdB). As Mäkinen told me in an email, not only did the half-quantum vortices survive helium’s transition into both of the polar distorted superfluid phases, which had never been seen before, but the fact that the vortices survived the transition to pdB meant that “walls bounded by strings” must have been created in the process. Unlike a normal wall we encounter in day-to-day life, these quantum walls do not block the flow of the helium vortices but rather alter the magnetic properties of the helium in the vortex. This was the first time that walls bounded by strings, also known as domain walls, were created in a laboratory setting. The dynamics of symmetry-breaking and the topological defects that are produced during phase transitions are fundamental to how some cosmologists explain how the universe formed directly after the Big Bang. The further back in time we go toward the Big Bang, the matter in the universe gets hotter, and more symmetric. This process can be extrapolated back to the earliest instance, a theoretical point known as the “grand unification.” This might be thought of as the original phase, which rapidly underwent a series of transitions in the first few seconds after the Big Bang until the universe gradually cooled and formed the matter that we’re all familiar with today. The problem for cosmologists is that the extremely high temperatures and pressures that dominated the first microseconds after the Big Bang would have prevented the creation of permanent particles. These could only come about later, after the universe had sufficiently cooled.What cosmologists want to understand, then, is the dynamics of the phase transitions in the early universe that allowed for the emergence of the fundamental forces (weak, strong, electromagnetic) and finally the particles that make up the ordinary matter we’re all familiar with. According to Tanmay Vachaspati, a theoretical cosmologist at Arizona State University, there is a grand unified model that incorporates vortices and walls as the precursors of axions, a leading particle candidate for dark matter. Although the vortices and domain walls would be destroyed in the process of producing the axions, the resulting dark matter would be the scaffolding upon which the large scale structures of the universe, such as galaxies, are built. Although this theory about vortices in the early universe and their role in the macrostructure of the universe has been around for decades, it lacked any clear path to an experimental test. The theory about the role of half-quantum vortices in the formation of the macrostructure of the universe is by no means widely accepted. Mäkinen said that many leading cosmologists have abandoned this idea in favor of quantum fluctuations and inflation as the explanation for the large-scale structure of the universe. Nevertheless, Vachaspati that since the physics demonstrated in the lab would carry over to the universe at large, the results of the experiments in the Aalto lab are of interest to cosmologists. In this respect, Mäkinen and his colleagues have created a way for cosmologists to experimentally recreate properties of the early universe predicted in some cosmological models. Going forward, these experimental tests of cosmological theories could greatly advance our understanding of why the universe formed the way it did—or at least help rule out some alternative theories.